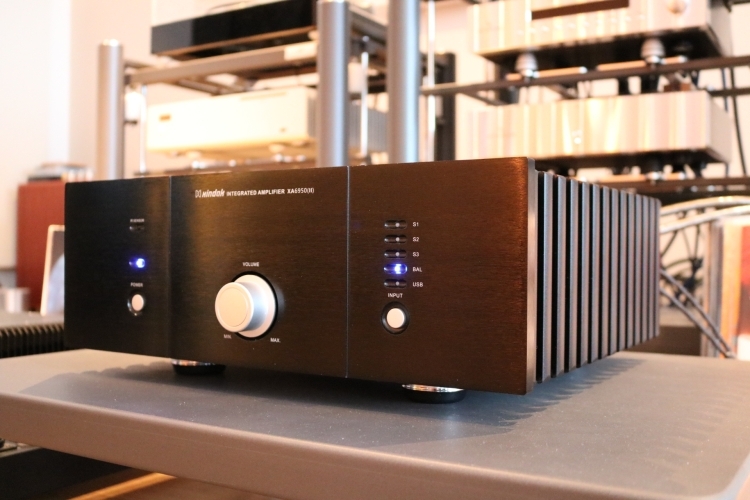 The amplifier reviewed here came along with the Aurum Cantus V30-M speakers that I also reviewed. Meanwhile, some other reviews had to be completed which lead to some delay, but some of this was very fortunate for the Xindak. For example, I was able to use it with the Wilson Watt/Puppy 8’s, and the Xindak turns out to drive them splendidly. But before I report on that, let me first go back to the beginning. Audreal products are manufactured by Xindak and are meant for distribution in Europe and the USA. The amplifier reviewed here is a Xindak, but it might as well have been an Audreal. The Xindak XA6950 II is a brand new product in the manufacturer’s catalog. 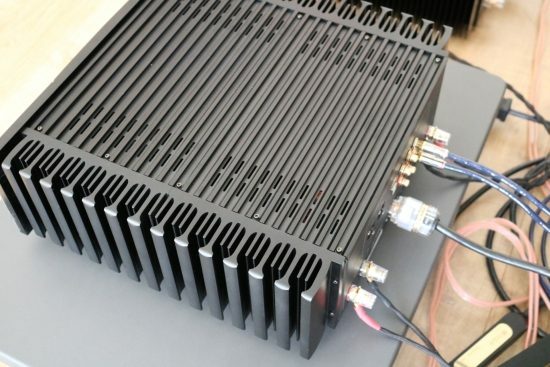 Externally very similar to the well-received A600E, the XA6950 II provides the same enclosure with an equally high build quality and promises excellent sound quality at very low cost. 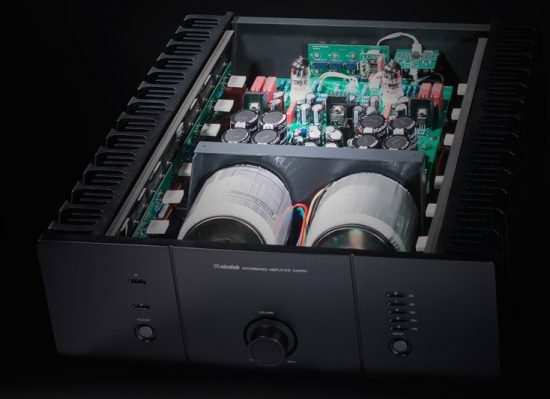 The XA6950 II is a hybrid tube/transistor amp in that the preamp stage is based around two 6922 tubes while the poweramp stage is solid state, and actually 40 watts of pure class A. In addition to XLR and cinch inputs, the amp also offers a USB input compatible with a wide range of audio source products. The amp is protected against DC output and overcurrent. With the Aurum Cantus speakers and Jorma Design no.3 speaker cable, the Xindak sound relaxed and open, with big bass and a rich golden glow, with nicely sweet treble. The sound is smoothly colorful and generous, and plenty powerful. It’s amazing the amount of bass coming from these small speakers! The XA6950 has more than enough power to drive the Aurum Cantus speakers very loudly, without ever hardening up or sounding forward. So far, the combination sounds excellent, and overall the sound is of high quality, but there’s one area where I feel that the combination is less endowed. To my ears, the timbre is not entirely natural. Many listeners may not be very sensitive to this, but having listened to pretty much color-less panel speakers myself for more than a decade, I am more than averagely sensitive to this. By timbre, I mean the tonality, or more precisely the way that an audio component portrays the texture and character of instruments. 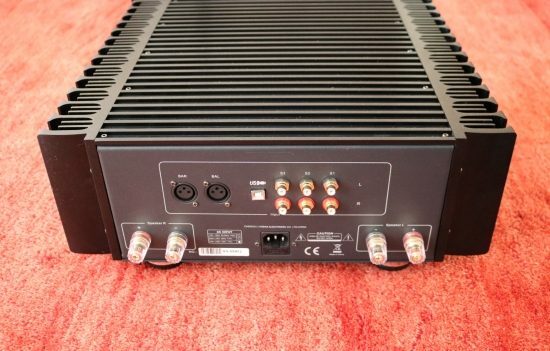 In the case of this amplifier, there’s a slight electronic nature to instruments that I think should sound acoustically more convincing. Piano, strings, and guitars sound proportionally right, but just a little synthetic. At first, I thought it was the speakers or perhaps this particular combination, but a cross-comparison with the Apogee Centaurs yielded the same result. 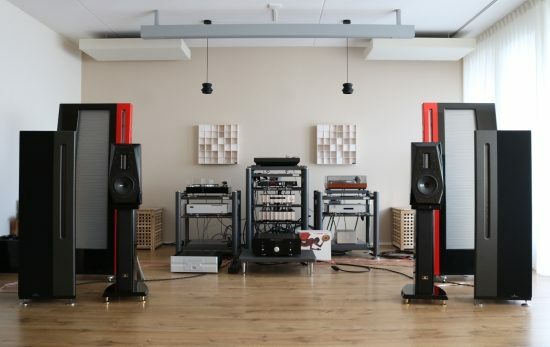 Further comparisons with the Aurum Cantus speakers revealed that these bring their own midrange colorations to the table, which makes for the only aspect where they are perhaps not the best match with this amplifier. Above and below: no matter how you look at it, the Xindak XA6950 looks great. Note the large and effective yet smoothly curved heatsinks. With the very revealing Apogee Centaurs, the XA6950 is just as relaxed and smooth, still with that golden glow and still absolutely never bright or harsh. This is an important factor because the Centaurs have very open treble and if a source component of the amplifier has a forward or hard nature, the Centaurs will make this clear in no uncertain terms. 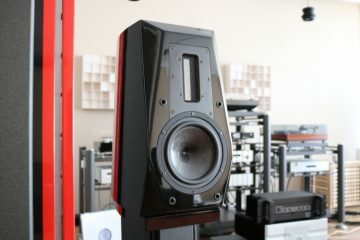 There’s a nice soundstage bubble around the speakers in all dimensions and good focus. The XA6950 seems to be easily stable enough to drive the Centaurs and can play loud without any stress, and there is no obvious shortage on detail but I have heard these speakers be more transparent and spritely with more high-end amps. Still, it’s quite out of the ordinary what the XA6950 achieves at such a low price. It has very good dynamics and absolutely does not sound restrained at all. Ultimate resolution aside, my biggest gripe with the sound so far remains the timbre. In spite of its smooth, warm and effortless sound, I can’t really get past this. Again, just like many people are not sensitive to the rainbow effect of DLP projectors just the same another listener may not understand what I am on about babbling about timbre. 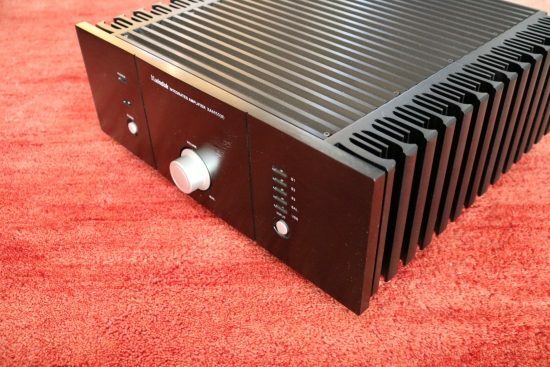 It is also important to note that this amp is very affordable and does indeed score many points in all other areas. Most components are sensitive to what they are placed on and the XA6950 is no different. This means that it is important to pay attention to details if you want to extract the maximum from it. Other than this it should be noted that it is not overly sensitive either. 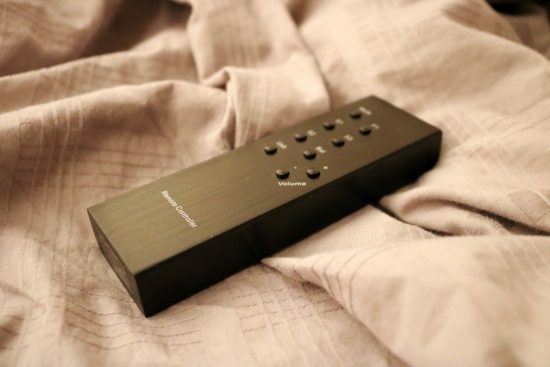 Above: superb full metal remote: simply unheard of at this amp’s cost! Placing the XA6950 on the spiked Artesania platform clearly improved midrange clarity as well as perceived speed and impact and bass articulation. Swapping the Belden + Furutech FI28 power cord for a Belden + IeGO power cord added even more solidity in the bass but at the cost of some loss of fluidity in the treble. These tweaks combine in a more direct and less romantic sound that some may prefer and others may not. I quite like the higher foot-tapping factor that they bring but your mileage may vary. In any event, the amp’s inherently colorful and relaxed nature is not fundamentally altered by such tweaks. Amazingly, the Xindak drives the full range Duettas with incredible ease. At this stage, I must conclude that despite its 40 watts, it must have a superb power supply that provides reference class grip on a wide range of speakers. 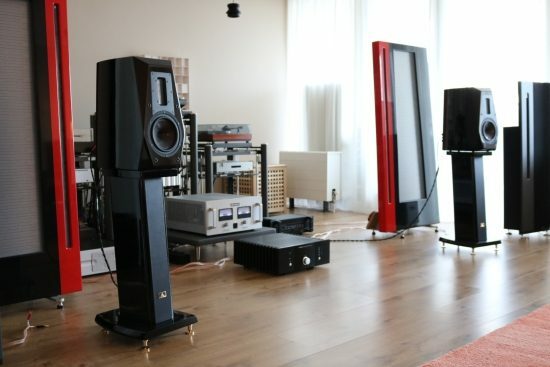 There is no slowness in the bass, no lacking in the PRAT department, no harshness or edginess, just the aforementioned “processed” quality in the midrange and not the full extent of resolution and transparency that I am used to with these speakers. Other than that, it drives even these big ribbons with gusto. In fact, when switching off my audiophile sensors I must admit that this is a toe-tapping and very musical performance. Switching from its analog input 1 using a Siltech Paris cinch cable to using the amp’s XLR inputs with the old but still great TTL’d Cardas Hexlink Golden 5C wrings some more timbral naturalness, but the difference is not huge. 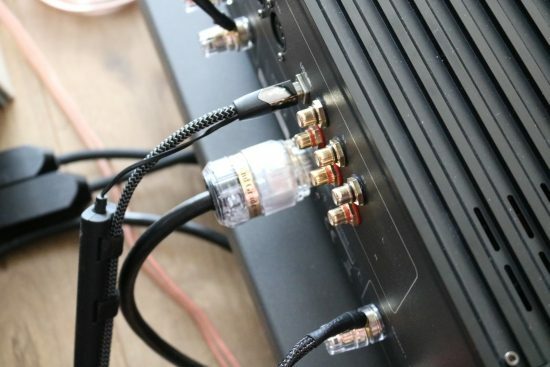 Going from analog from the Bricasti M1 DAC to the amp’s built-in USB input and streaming directly from the AudioAanZee Reference Flow fed by Roon via an AudioQuest Diamond USB cable indicates that not only the USB input is of great quality but the amp sounds very even-handed across its inputs as well. 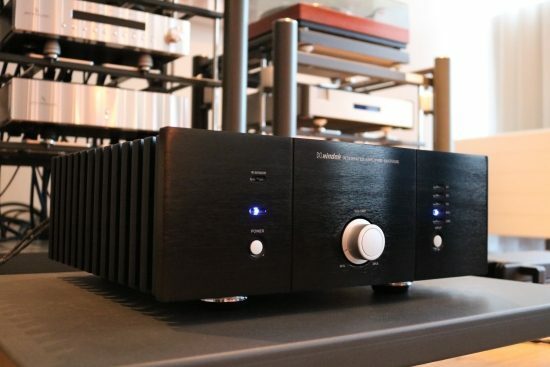 While the Bricasti naturally does some things that the built-in DAC does not do, I’d say that the built-in DAC still is so good, that it is not necessary to get an external DAC, certainly not one in the amp’s price range. Cross comparing quite unfairly with a Bryston 4B Cubed (SST3) and (even more unfair) a Jeff Rowland Corus preamp feeding it confirms my suspicions regarding timbre, but also shows a few areas in which the Xindak is surprisingly great. The Bryston is similarly relaxed and smooth but it doesn’t quite have that lush golden glow in the midrange, and sounds just a bit soberer than the hybrid tube/class A Xindak. The Bryston does have clearer transients, more detail and focus and it sounds rhythmically more assured but surprisingly, it does not sound more powerful, nor does it provide a subjectively more dynamic sound. And that is true with all the speakers that I tried it with, including the Wilson Watt/Puppy 8. After the Xindak had already returned to Jack I was in the lucky position to find a pristine used pair of Wilson Watt/Puppies and after a few days of evaluation, I got the urge to ask Jack to come back with the amp just real quickly, to give it a second chance. Because apart from the Aurum Cantus speakers, I had only used the Xindak with Apogees, I figured that perhaps I had been a little overly focused on timbre. After all, ribbon speakers are just very revealing of colorations because they add so little themselves. What if the amp behaved entirely differently with the Wilsons? As expected and hoped, timbre was now much more natural. In fact, the aforementioned processed quality that was so evident with the Apogee Centaurs was now almost completely gone, likely unnoticeable to all but the most critical listeners. 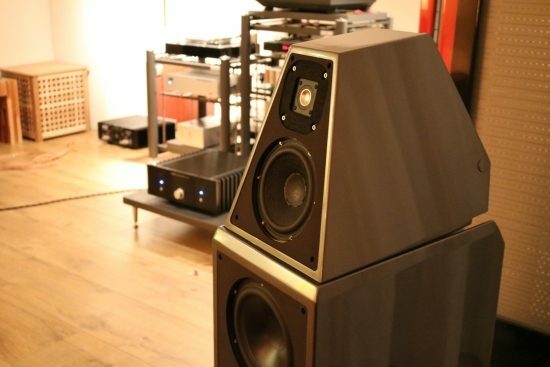 Again I was amazed at the ease with which the Xindak seems to drive any speaker that I care to connect, including these Wilsons. As Jack and I smiled I cranked the volume knob and backed off only because we both felt it was plenty loud enough, not because the amp or the speakers protested in any way. 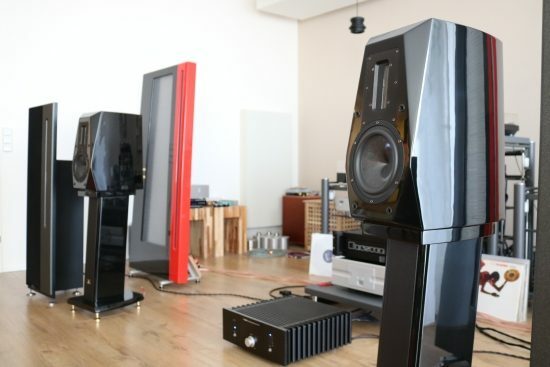 With the Wilsons, the Xindak has a solid, well-paced and dynamic sound, with a magically rich midrange but tighter bass than the Bryston, which made for a better match in that respect with the Wilsons. Like Apogees, Wilsons are known to highlight any issues in the treble but once again, treble was spotless: smooth, refined and airy. As observed with the other speakers, the Xindak’s transient sharpness and resolution are good, but not benchmark setting, same for the image focus and depth layering. But these are audiophile traits that don’t necessarily increase the emotional conveyance of music. Speed and PRAT are, and these aspects are precisely right: the amp is not too fast but also not too slow. Although you can hear that the Wilsons can do better, this is a very good performance. 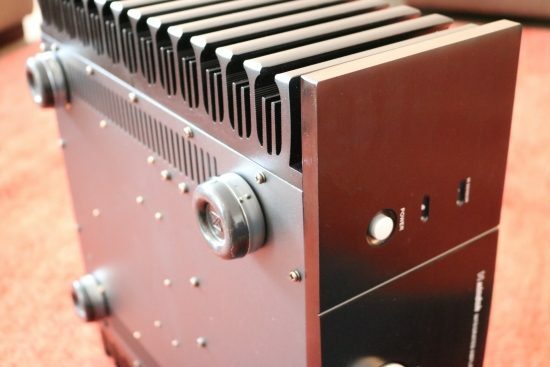 Let me correct that: actually, it is quite ridiculous what this 1689 euro amp achieves. The Xindak XA6950 II’s best virtue is that it sounds well-paced, solid, full-bodied and powerful, yet completely effortless and relaxed. Usually, it costs a lot more to have an amp combine these aspects. 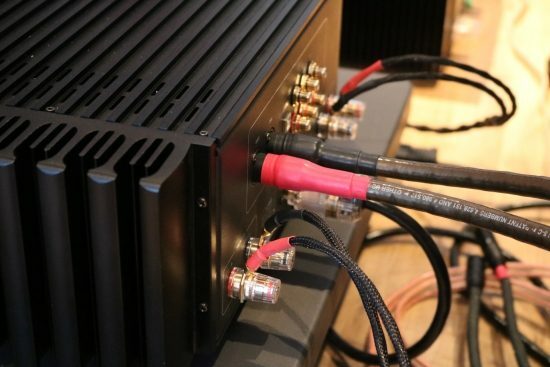 Add to this a majestic golden glow in the midrange and the amp’s utter refusal to harden up at higher sound levels, and the deal becomes pretty sweet. That its resolution and timbre are ultimately not entirely on the level that this author would like, should not detract from an otherwise very, very good deal. 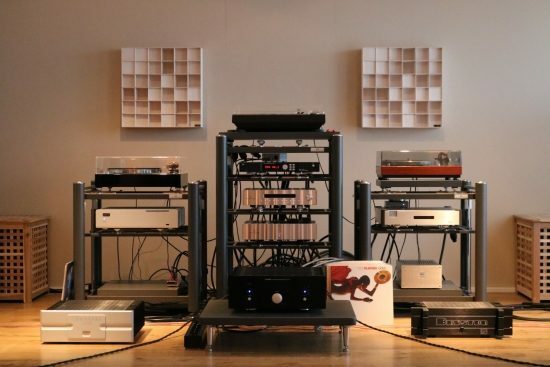 Audiophiles on a budget should definitely not hold back on auditioning it.